With a worldwide gross of nearly $1.5 billion, Marvel's The Avengers is one of the biggest box-office hits of all time of all time. When the movie hits the home video market, you can bet it's going to do so with style that would make Tony Stark proud. As we reported earlier, the Avengers Blu-rays will be packed with goodies, including commentary with writer/director Joss Whedon, multiple featurettes, and even a gag reel. All in all, it's a must-buy. 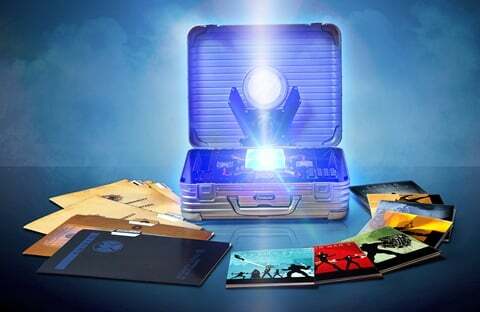 But hold your horses there, chief...if you're a true, die-hard Marvel zombie, you might want to feast your eyes on this baby: the Marvel Cinematic Universe: Phase One box set, which comes out on September 25th, the same day as the Avengers release. Yep, that's a rather badass replica of Nick Fury's briefcase from The Avengers, complete with a light-up version of the Tesseract/Cosmic Cube. As far as distinctive packaging goes, this one is right up there with the Alien Anthology limited edition. As you'd expect, the Phase One box set includes Blu-ray versions of all the "canonical" Marvel Universe films thus far: Iron Man, The Incredible Hulk, Iron Man 2, Thor, Captain America: The First Avenger, and The Avengers. The will also net you a bonus disc filled with behind-the-scenes extras, as well as "exquisitely detailed art, prop reproductions and artifacts from the motion pictures." While you'll have to wait till September to get your grubby little mitts on it, you can pre-order Marvel Cinematic Universe: Phase One over at Amazon as we speak.